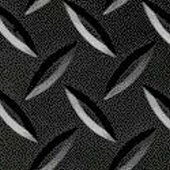 Please contact us for your conductive matting needs. We highly recommend the Diamond Stat product because of price, quality, and reliability. 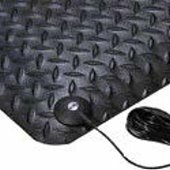 Diamond Stat™ is a conductive/anti-static mat designed to absorb static electricity. The mat drains static electricity from the worker keeping sensitive circuitry from being damaged. The durable vinyl diamond-plate design provides non-directional traction, and is easy to clean. The top surface is combined with a dense closed cell foam base utilizing NoTrax® exclusive UniFusion™ technology virtually eliminating the possibility of de-lamination. Now with RedStop™, a uniquely engineered technology that eliminates the slipping and sliding of NoTrax® floor mats on all types of smooth floor surfaces such as vinyl composite tile, painted or epoxy coated concrete, vinyl sheet flooring, carpet, and ceramic tile. Dissipative /anti-static mats are formulated to absorb static electricity. This mat drains static from worker keeping sensitive circuitry safe from damage. Durable vinyl diamond-plate top surface is combined with dense closed cell foam base utilizing NoTrax® exclusive UniFusion™ technology.